Search Results for "cruise caribbean"
Caribbean Boat Cruising Bow View. Catamaran boat with camera angle on top of the left bow while cruising the Caribbean ocean. ORLANDO, FLORIDA - FEB. 5: The Oasis of the Seas, one of Royal Caribbean Cruise thats has been considered one of the most large cruises in the world on Feb.5, 2017 in Orlando, Florida. ST MARTIN, CRUISE PORT- JULY 29: Royal Caribbean cruise ship Explorer of the Seas docked at the cruise port on the island of Saint Martin on July 29th, 2013. Puerto Rico tourist taking photos with smart phone at Old San Juan Fort Castillo San Felipe Del Morro. Asian tourist on Caribbean cruise travel visiting a famous landmark during summer vacations. Puerto Rico tourist taking photo at Old San El Morro and Cemetery by Fort Castillo San Felipe Del Morro. Woman tourist on her Caribbean cruise visiting Santa Maria Magdalena de Pazzis Cemetery. Puerto Rico woman taking pictures with smartphone at Old San Juan Fort Castillo San Felipe Del Morro. Asian tourist on her Caribbean cruise visiting a famous landmark during summer vacations. Tourist woman walking relaxing on Beachy Head Beach bay in Barbados, a Caribbean cruise destination. Tropical beach next to Ginger Bay on the South Coast of Barbados in the parish of St Philip. Caribbean cruise in the Bahamas. POV shot with clouds during sunset. 1080p HD. Miami, FL - JAN 11: Aft view from a cruise ship leaving the Port of Miami on January 11, 2018 in Miami, Florida. 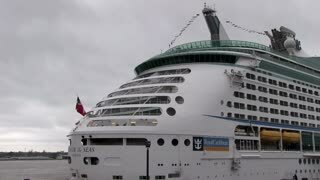 A Carnival Cruise Line and Royal Caribbean cruise ship are also leaving port. Rich Blue Caribbean Water Going By a Cruising Ship. Hiking woman on travel excursion during holiday cruise looking at St Kitts and Nevis landscape. Caribbean nature during summer vacations. Young girl standing at lookout looking at viewpoint. Cozumel Mexico cruise and ferry boat harbor downtown pan. Island in Caribbean Sea off coast of Mexico's Yucatan Peninsula near Playa del Carmen. A major cruise ship destination, vacation and resort area.